TSKK has two classrooms. One large and another smaller in size. 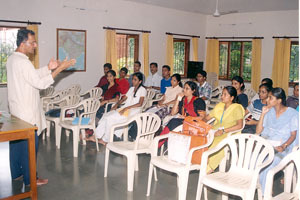 Audio visual facilities like overhead projector, LCD projector, T.V., home theatre, laptop, whiteboard, etc. are available in these classrooms. 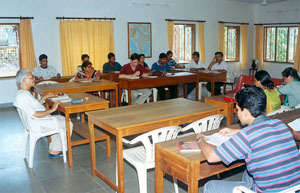 These classrooms are available for courses, lectures, seminars, workshops and related activities. A small outdoor stage and the quadrangle with lawn can be used as an auditorium for presenting informal stage performances and other functions. Classrooms are equipped with teaching material in the form of educational toys, charts, maps, models, pictures, posters, different types of boards, DVDs and VCDs.